van der Berg, A. (2007). 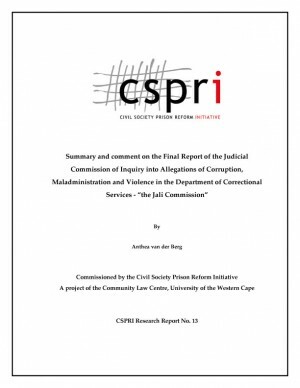 Summary and Comment on the Final Report of the Judicial Commission of Inquiry into Allegations of Corruption, Maladministration and Violence in the Department of Correctional Services – "the Jali Commission". Civil Society Prison Reform Initiative: Cape Town, South Africa. In August 2001, the State President appointed a Commission of Inquiry to investigate and report on corruption, maladministration, violence, and intimidation in the Department of Correctional Services (DCS). The full report of the Commission is a lengthy document, some 1 800 pages long, and it must be assumed that only the most dedicated researchers and officials will read and study it in its entirety. It is important that the substance of the report be made more accessible to stakeholders, so that the debate arising from the Commission may be sustained. Debating the findings of the Commission is important and ought to involve civil society and oversight structures that have a role to play in ensuring that good governance is maintained and corruption and human rights abuses in the prison system are countered. This document summarises the findings of the Commission’s report in a user-friendly question-and-answer format to allow the reader ease of reference to key issues. The objectives of this report are to: (1) summarise selected important issues covered by the Commission; (2) provide a plain language document, which is accessible to government departments, academics and civil society; and (3) encourage discussion and debate on key recommendations made by the Commission.